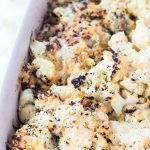 Everything bagel Cauliflower Casserole- a healthier Thanksgiving dish that is cheesy, salty and garlicky all in one bite. Low carbohydrate, vegetarian and high in fiber. Now, I know that it is still October but Friendsgivings and Thanksgiving are right around the corner. I made a version of this dish for last Thanksgiving and it was the first thing gone. I mean, who doesn’t love everything bagel seasoning, cheese and cauliflower? Bake it in a casserole and make that crispy cheese on top and you’ve got a party in your mouth. If you haven’t noticed, I’ve got a thing for a crunchy top to casseroles. I love the different level of texture it brings to the dish! 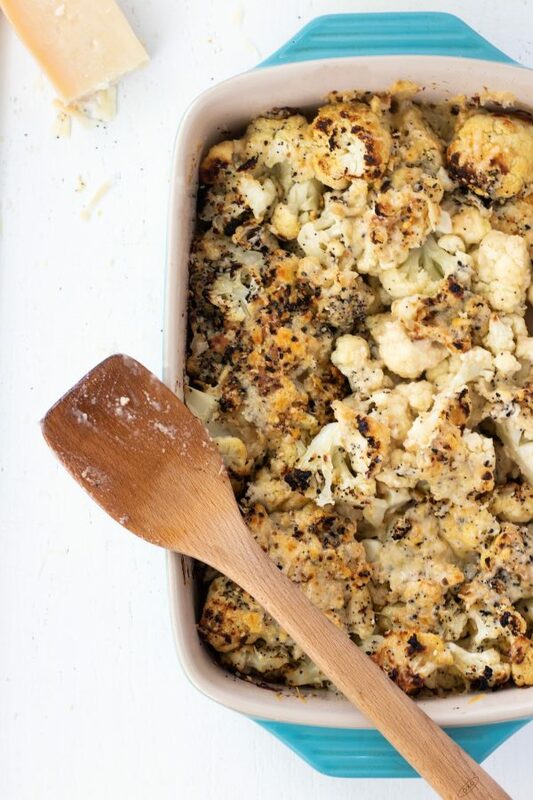 This everything bagel cauliflower casserole is the healthier thanksgiving dish of MY DREAMS. It is topped with parmesan cheese and everything bagel seasoning that creates a salty, cheesy and crispy layer to top the casserole. 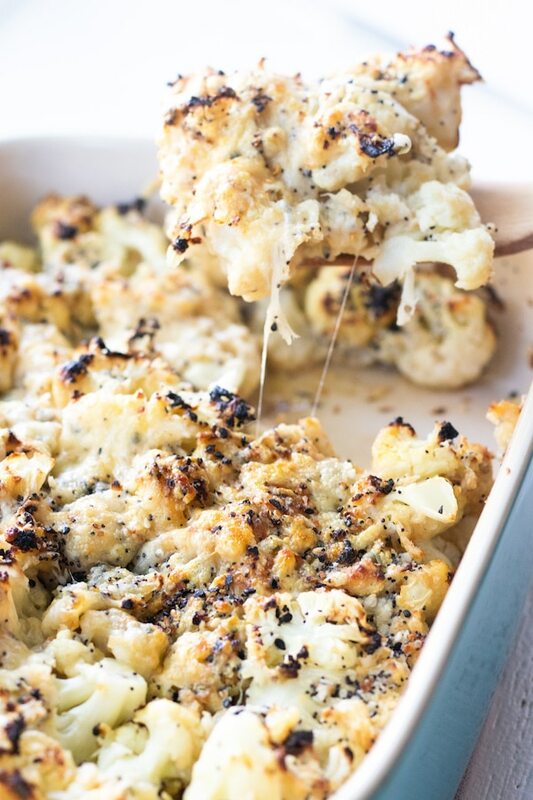 It gets better underneath with a creamy slurry of roux lathered on the pieces of cauliflower that are baked until soft. I’m not kidding when I tell you that I could eat the whole thing in one sitting. The trend of everything bagel seasoning, thanks to Trader Joe’s, is a wonderful thing. If you don’t live around a Trader Joe’s you can make your own everything bagel seasoning. I also found it here, and I believe they have it at Walmart. 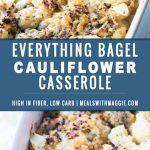 Hope you guys enjoy this everything bagel cauliflower casserole as much as I do! A lighter thanksgiving dish that is cheesy, salty and garlicky all in one bite. 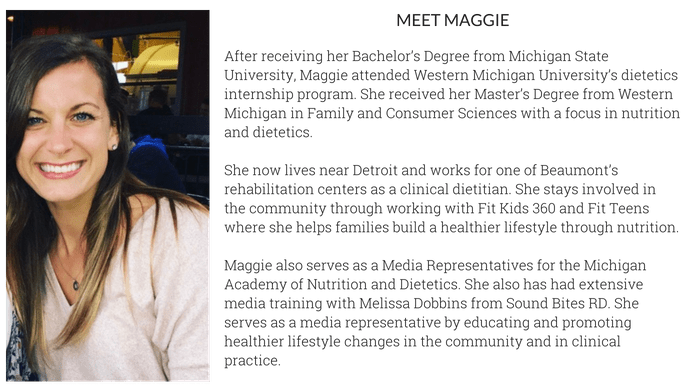 Low carbohydrate, vegetarian and high in fiber. Prepare a casserole dish by using non-stick cooking spray and preheat oven to 425F. Melt butter in a large stock pot over medium high heat on the stove. Once butter begins to melt, add in sliced garlic, being careful not to burn the garlic. Once garlic is fragrant, begin making a roux by adding in 1 tablespoon of flour, whisking to combine with butter and garlic. Slowly add 1/4 cup milk to mixture, still whisking to combine. Continue with remaining flour and milk until a thick roux forms and no clumps remain. You may need to add more flour to thicken depending on how much milk you used. Once the roux if ready, turn heat down to medium and add in cauliflower. Stir to combine or until the cauliflower is well coated with the roux. Add in pepper and mix to combine. 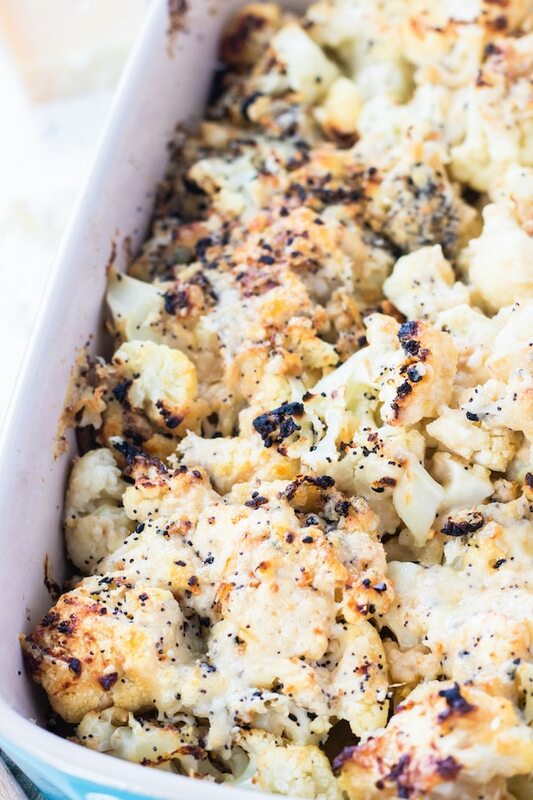 Pour cauliflower into prepared casserole dish and bake for 35 minutes or until cauliflower is tender. While cauliflower is cooking, toss parmesan cheese and everything bagel seasoning in a small bowl. When the cauliflower is tender, remove from oven and top with cheese and everything bagel seasoning mixture. Turn the oven to broil and watch carefully for 2-3 minutes until the cheese turns a deep golden color. I used whole wheat flour for my roux. I have not tried any other flour other than this one, but you may need to adjust flour to milk ratio if you use another flour or milk. 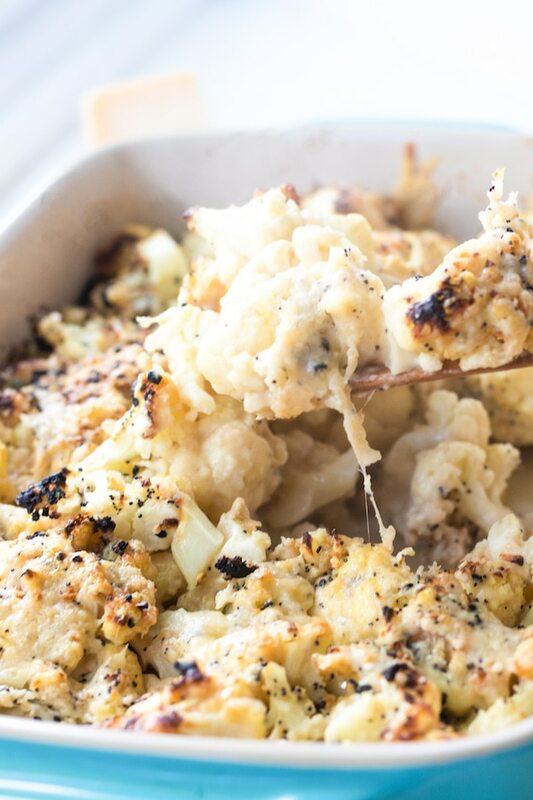 I made the cauliflower casserole over the weekend and everyone loved it! I used Canadian Steak Seasoning because I didn’t have the bagel seasoning. It was very good and I will make it again! Thank you and what a great idea with the steak seasoning ! Thank you Jenny ! It’s so hard to stop eating it ! I don’t blame you!